Where to buy a Liverpool FC Scarf? I am looking for a scarf as part of a gift for a friend but I don't know where to buy one online. I tried a few sites but they simply sell kits and training gear. Anyone can help me? 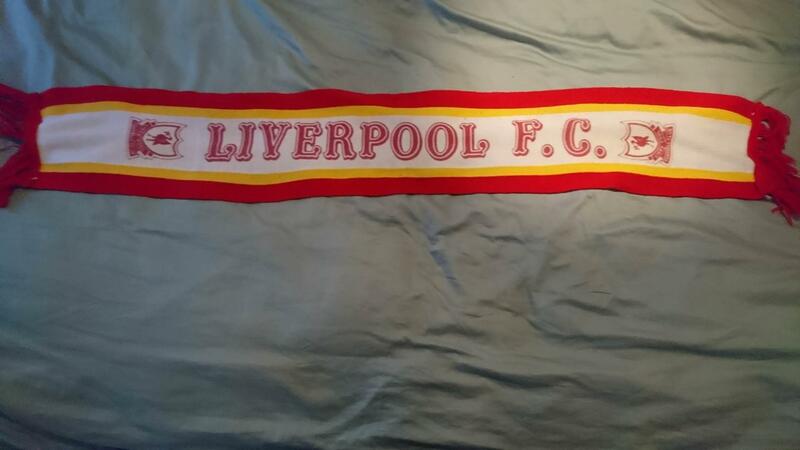 Re: Where to buy a Liverpool FC Scarf? There's also 20% off everything in the online store on the official website this weekend Adam. I might buy the green euro shirt this weekend. £26 with kuyt 18 on it. With 20% off that's £20.80 + £5 delivery £25.80 in total. Got a bit carried away there, going off topic. There's 50% off the green euro shirt ...........even better for you eh. Good luck Adam, I hope you get fixed up. Is it the signed shirt in the box? Sounds like a good time to buy my euro shirt this weekend atleast. Apologies to Adam..........I feel like we've taken over your thread. Thanks but the official store is terrible got delivery services to Canada. I remember 4 years about I got the yellow away kit, I bought it online in September and never got it til December. I would never never never never buy anything from there again (I probably should of stated it when I post the topic). I bought stuff from subside and kitbag and they take about 2 to 3 weeks. Did you get it Adam? Yeah I got it for about 3 quid (well 7 quid when you add shipping into it). It is a black one but I think she will like it. Nice one, looks good that, good price as well. Glad you got one mate, nice too. Just got it today and it looks great, just in time too for my friends birthday. Hope she likes it. I didnt find better topic to ask it, but is LFC scarf for every day using ? or most people use it only in match days ? Cold days, match days or just to annoy manc fuckers Dynami:t.
Some really good dress scarfs in the Lfc shops and at sale price, well worth a look. Seems like i have to buy it from online store,where other 8 euros are added. I am trying to buy a match-day scarf for LFC vs Spartak Moscow. I live overseas. Does any know where i can buy this online, or contact details for the company that makes these? Alternatively, is there another Reds fan in Liverpool that would have some spare time to assist me? Trying to look out for a retro scarf like I used to wear when standing on the Kop. Red with two white stripes running the full length of it. Anyone knows of one or sees one out there on the net please give me a Heads Up. Unfortunately, my neighbour passed away a few years ago so i cant ask him anymore about it. Does anyone recognise this scarf? How old is it? Is it an official one or not? I tryed asking on facebook and twitter and things like that but noone seems to have an answer for me.